Hannan senior Malachi Cade (3) attempts to drive the lane against a Buffalo defender during the first half of Thursday night’s 65-53 loss in Ashton, W.Va.
ASHTON, W. Va. — Every story needs a hero and a villain. Thursday night in Mason County was a milestone occasion for Hannan senior Malachi Cade, as he became the ninth basketball player in school history to reach the career scoring mark of 1,000 points. Visiting Buffalo, however, utilized a 16-0 run in the following moments of the third quarter and rolled to a 65-53 victory. Cade entered the contest 11 points shy of the becoming the latest member of the Wildcats’ 1,000-point club, and the first player since 2015 to do so. HHS (7-11) opened the game with a field goal , but BHS (6-12) countered with a trifecta as the two squads traded leads in the first period. The Blue and White, however, manufactured a 7-2 run over the final 1:04 to take an 18-16 advantage into the second quarter. The Bison started the second period with a 13-0 run as they held their hosts scoreless over a span of 6:14. The Wildcats countered with a 9-2 run to enter the locker room trailing by a score of 31-27. HHS made 10-of-32 field goal attempts for 31 percent during the first half, including o-of-7 from three-point range. The Wildcats gathered 20 rebounds, committed 10 turnovers and were also were also 7-of-12 from the charity stripe for 58 percent. In contrast, Buffalo connected on 13-of-34 shots from the field for 38 percent, including 2-0f-14 from long distance for 14 percent. The Bison also made 3-of-4 from the free throw line for 75 percent. The Blue and Gold hit the boards for 18 rebounds and committed six giveaways at the midway mark. The start of the second half brought with it a tie at 31-all, as well as a career highlight for Cade. The senior not only knotted the game with 6:58 remaining in the third period, but wrote his name in the Hannan High School athletic history book with a timely putback for his 1,000th career point. Following a short stoppage of play to recognize the accomplishment, the Bison closed the third frame on a 16-4 run to take a 47-35 lead into the finale. 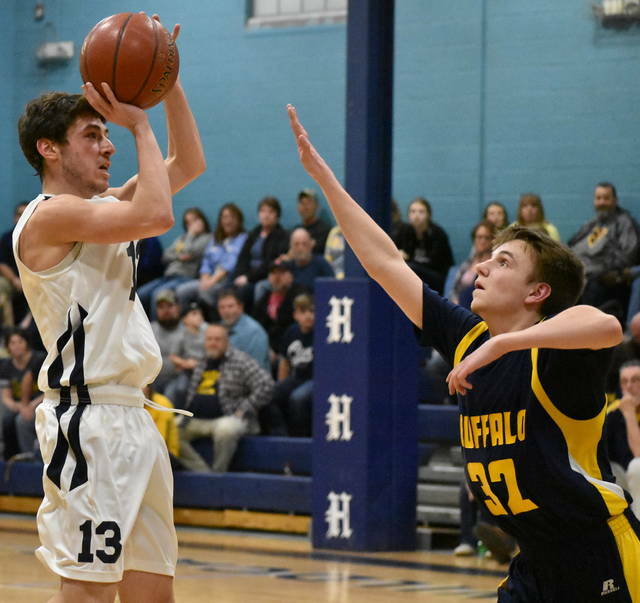 HHS opened the fourth quarter on a 9-0 run to cut the Buffalo lead to 47-43, but BHS outscored 18-10 over the final 5:48 of the game to close out the 12-point win. “I’m so proud of them,” Hannan head coach Becky Ferrell said following the game. “They fought their hardest. We are making due with what we have and fighting the fight. The Wildcats made 20-of-64 field goal attempts for 31 percent, including 2-of-17 from beyond the arc for 11 percent. HHS also made 7-of-13 from the free throw line for 53 percent, gathered 41 rebounds and committed 23 turnovers. Dalton Coleman led the way with a game-high 21 markers. Cade followed with 18 points, including two trifectas. Logan Nibert was next with six points, while Devrick Burris provided four markers. Matthew Qualls and Andrew Gillispie rounded out the scoring with two points apiece, respectively. 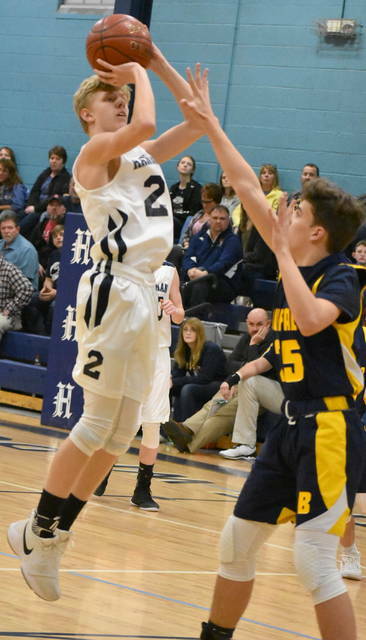 BHS connected on 19-of-62 shots from the field for 30 percent, including 5-of-25 from three-point range for 20 percent. The Bison hit 12-of-19 from the charity stripe for 63 percent. Buffalo also collected 33 rebounds and committed 14 turnovers. Alec Hanshaw and Noah Thompson each finished with 16 markers to lead the Blue and Gold. Tyler Morlachetta added 10 points, while Jackson England was next with nine markers. Dalton Huddle and Stephen Booth followed with six points and five markers, respectively. Nate Gibson concluded the scoring for the Bison with one trifecta. The Wildcats return to the hardwood Tuesday when they travel to face Meadow Bridge. 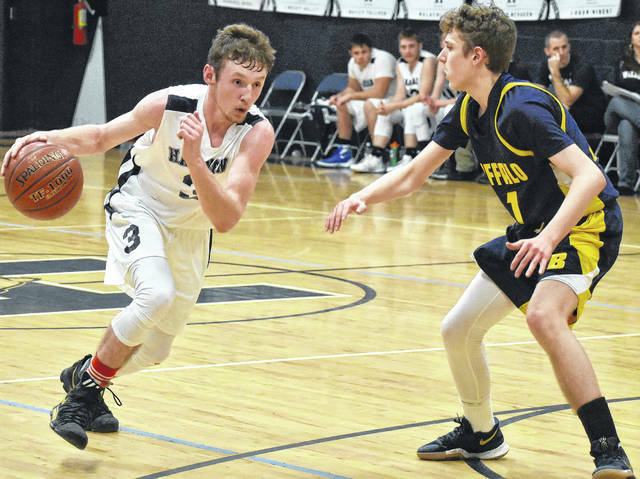 The Bison also won their first meeting with Hannan, taking a 47-36 decision on Jan. 3 in Putnam County. https://www.mydailyregister.com/wp-content/uploads/sites/24/2018/02/web1_2.17-HAN-Cade.jpgHannan senior Malachi Cade (3) attempts to drive the lane against a Buffalo defender during the first half of Thursday night’s 65-53 loss in Ashton, W.Va.